(by CBS News) – On the sand, in the air and in the water, the U.S. Marines at Camp Pendleton are training for the next generation of warfare. “The unique thing is having the actual scientists and engineers in the field for two weeks testing and evaluating a host of technologies,” Col. Dan Sullivan said. This week’s exercise brings together more than 100 pieces of advanced technology and lets Marines work with them in simulated amphibious assault scenarios. But putting so much faith in autonomous devices raises concerns over hacking. “This is being designed with the cyber threat in mind,” Col. Sullivan said. “If there’s no cyber security, it’s no good?” CBS News correspondent Carter Evans asked. “I think that’s quickly becoming our center of gravity, is defending our network,” Sullivan said. The technology was designed by both military and civilian innovators, but not all of it was originally intended for the battlefield. The hyper-sub is a speedboat that turns into a submarine. If it sounds like a kid’s James Bond fantasy, that’s exactly how it started out for inventor Reynolds Marion. “I just always figured it would be a good idea as a kid to be able to have a really cool speed boat that could go out and dive when you wanted to dive,” Marion said. From youthful minds, these creations are now in the hands of young warriors like Cpl. Edmund Kennedy. “You’ve been in the Marines four years and yet you’ve all this top brass asking you, ‘What do you think?’” Evans asked. “Yes sir, that’s definitely a change of pace,” Kennedy said. He’s one of the Marines participating in the exercise, and for him, a lot of the technology feels familiar. “It was almost like being at home and playing a video game,” Kennedy said. “Not in a million years” did he think he’d bring his gaming skills to the job. “My mother told me [playing video games] was a waste of time but look at me now, mom!” Kennedy said, laughing. 1. 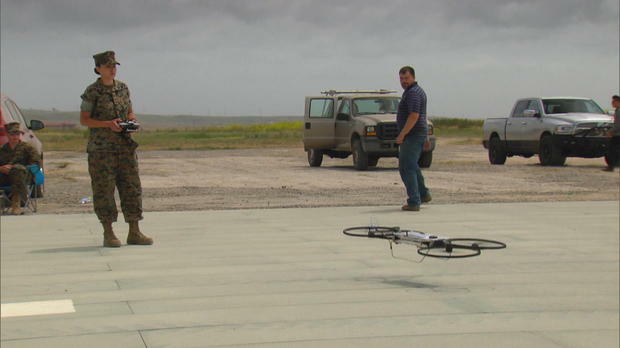 What types of high-tech tools are the U.S. Marines at Camp Pendleton testing out in two weeks of exercises? 2. What is unique about the testing period? 3. a) What does this week’s exercise entail? b) What concern are they addressing when testing this advanced technology? 4. Who designed the technology the marines are testing out? 5. What is the goal of the exercise? 6. How does this news story inspire you?